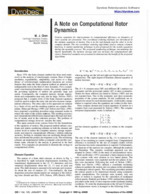 Concise equations for improvements in computational efficiency on dynamics of rotor systems are presented. Two coordinate ordering methods are introduced in the element equations of motion. One is in the real domain and the other is in the complex domain. The two coordinate ordering algorithms lead to compact element matrices. A station numbering technique is also proposed for the system equations during the assembly process. The proposed numbering technique can minimize the matrix bandwidth, the memory storage and can increase the computational efficiency. Numerical examples are presented to demonstrate the benefit of the proposed algorithms.